Peritonitis is an important cause of morbidity and technique failure in patients with end-stage renal disease (ESRD) treated by continuous ambulatory peritoneal dialysis (CAPD). The most common pathogens isolated from infected peritoneal effluent in these patients are Gram-positive bacteria. Fungal peritonitis (FP) is rare, but a serious complication of peritoneal dialysis (PD). We describe herein a case of peritonitis caused by an uncommon fungal organism, Alternaria alternata. A 75-year-old woman with a history of hyper-tension, coronary artery disease and ESRD secondary to diabetes mellitus had been undergoing CAPD for two years. The patient had been in stable condition with no episodes of peritonitis until the recent episode when she developed cloudy PD effluent and mild abdominal pain. Clinical examination demonstrated abdominal rebound tenderness, fever, and cloudy dialysis effluent. Initial analysis of the effluent showed 2100 white blood cells/μL, with 74% segmented neutrophils. Bacterial cultures of the dialysis effluent yielded no growth. The negativity of the bacteriological examination and the presence of black deposits on the dialysis catheter argued toward the fungal origin of the peritonitis [Figure 1]. Direct microscopic examination of the peritoneal effluent revealed brunching septate hyphae and culture on Sabouraud dextrose agar yielded Alternaria on three consecutive specimen from the dialysate [Figure 2]. Species identification was performed by using both Matrix desorption ionization of flight (Maldi-Tof) and DNA sequencing. 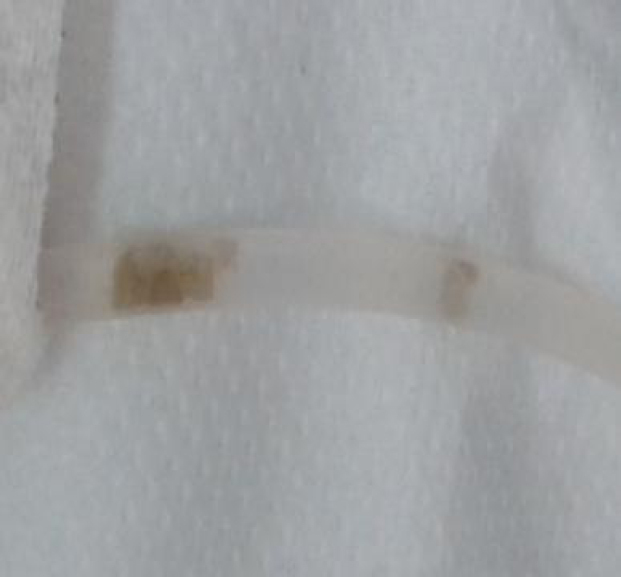 Figure 1: Black deposits on the peritoneal dialysis catheter. 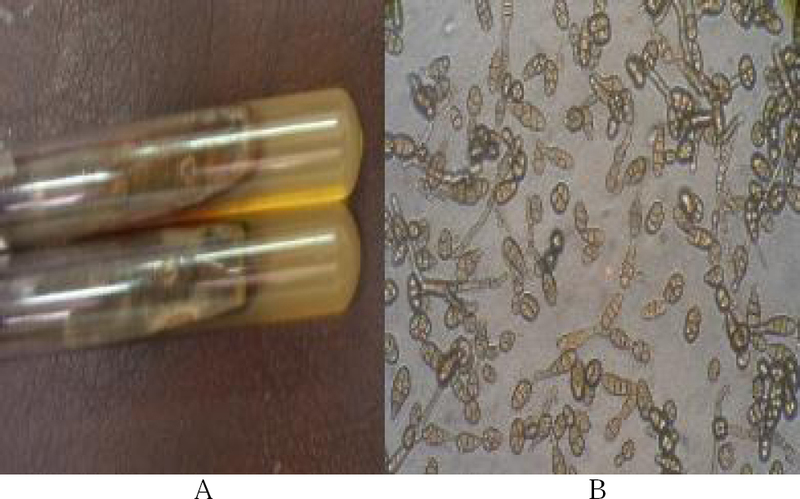 Figure 2: Macroscopic (a) and microscopic (b) aspects of Alternaria alternata. Three days after empirical therapy for peritonitis with vancomycin and gentamycin, the patient was treated with oral voriconazole at a dose of 400 mg/day for four weeks. The evolution was marked by transient sterilization, then a recurrence of peritonitis, and hence, the catheter was removed and the patient was started on hemodialysis (HD). The peritonitis episode resolved, but because of the important inflammatory process, the patient was maintained on regular HD. FP accounts for approximately 10% of CAPD peritonitis., Among patients undergoing PD, FP carries a higher morbidity, mortality (22%–33%) and CAPD discontinuation (50%–85%) than bacterial infections. The most common pathogen causing FP is Candida species, followed by Aspergillus species. To the best of our knowledge, only four cases of Alternaria peritonitis have been reported;,,, in two of them, species identification was performed: Alternaria tenuissima was the causative agent in one case and A. Alternata in the other case. Alternaria is a dematiaceous mould of the deuteromycete form-class of the fungi imperfecti. The organism arises from the soil and is a ubiquitous plant saprophyte. It is an opportunistic pathogen and causes disease in humans and domestic animals by the entry of fungal spores into the host through skin lesions. The fungi enter the peritoneal cavity intraluminally or periluminally; very rarely, they enter through the vaginal route. Risk factors of FP include prolonged use of systemic or intra-peritoneal antibiotics within a month of developing the FP and previous bacterial peritonitis. According to retrospective studies, 50%–80% of patients with FP received broad-spectrum antibiotics in the preceding three months. However, in our patient, no prior prolonged antibiotics were prescribed. Additional risk factors are immunosuppression and malnutrition, bowel perforation, diverticulitis, and presumably diabetes or neoplastic diseases. In our case reported, none of the known risk factors including poor hygiene of the patient or her caregiver, the presence of pets at home, history of vaginal discharge and predisposing occupation were found. FP is a serious complication of PD leading to loss of ultrafiltration and discontinuation of PD treatment. The most frequently isolated fungi are Candida albicans and Candida Parapsilosis; filamentous fungi such A. alternata species are rarely found. Due to the rarity of black fungi peritonitis associated with PD, knowledge of the epidemiological and biological features of the disease is scarce. Thus, difficulties of diagnosis are a major cause of treatment delay. Voriconazole would be a good alternative in management decision. Prompt diagnosis of FP and early institution of therapy decreases the rates of morbidity and mortality. Bren A. Fungal peritonitis in patients on continuous ambulatory peritoneal dialysis. Eur J Clin Microbiol Infect Dis 1998;17:839-43. Nagappan R, Collins JF, Lee WT. Fungal peritonitis in continuous ambulatory peritoneal dialysis – The Auckland experience. Am J Kidney Dis 1992;20:492-6. Reiss-Levy E, Clingan P. Peritonitis caused by Alternaria alternata. Med J Aust 1981;2:44. Vogelgesang SA, Lockard JW, Quinn MJ, Hasbargen JA. Alternaria peritonitis in a patient undergoing continuous ambulatory peritoneal dialysis. Perit Dial Int 1990;10:313. Ryoo NH, Ha JS, Jeon DS, Kim JR, Hwang EA. Alternaria peritonitis after contact with a cat. Perit Dial Int 2009;29:235-6. Rossmann SN, Cernoch PL, Davis JR. Dematiaceous fungi are an increasing cause of human disease. Clin Infect Dis 1996;22:73-80. Keane WF, Vas SL. Peritonitis. In: Gokal R, Nolph KD, eds. Textbook of Peritoneal Dialysis. Dordrecht, The Netherlands: Kluwer; 1994. p. 473-501. Matuszkiewicz-Rowinska J. Update on fungal peritonitis and its treatment. Perit Dial Int 2009;29 Suppl 2:S161-5. Li PK, Szeto CC, Piraino B, et al. Peritoneal dialysis-related infections recommendations: 2010 update. Perit Dial Int 2010;30:393-423.